The Bonddad Blog: A thought for Sunday: if you are a Democrat, buck up! A thought for Sunday: if you are a Democrat, buck up! Hillary is a Clinton. Clintons are counterpunchers. She will jab and kick and scratch and claw her way back. If you are a Democrat, it is easy to become dispirited after the last week. If you were a Sanders supporter like me, Hillary Clinton has validated every concern about her unpopulatirty and electability that was argued in the primaries. But as somebody who spotted this turn of event almost as soon as it began in late August, I think I have a ltttle credibility in telling you not to give up the fight. 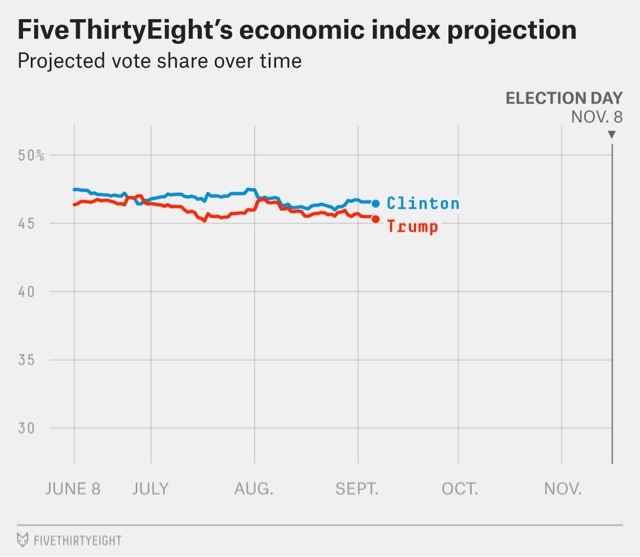 If this election were decided on the economy, Clinton would win by 1%. Douglas Hibbs' "Bread and Peace" model takes nto account wartime casualties. Since we have almost none, and no widespread violent civil unrest (both of which doomed Humphrey in 1968), that's not an issue. So the election boils down to the personal qualities of the candidates. Say what you will about Colin Powell, in his leaked emails he accurately pinpointed Hillary's critical flaw as overweening hubris. Hubris explains her naming of a transition team on Aug 16, her failure to go to Baton Rouge (even now) choosing instead to fundraise in the Hamptons, her failure to catch on to the new "presidential" Trump who debuted on August 19, her her hedging and qualifiying on the issue of her emails and the Clinton Foundation, and in general her going into "prevent defense" in mid-August, with the usual results of such a defense. My inner Spock concurs with the logic of her remark. My inner McCoy feels her contempt for ordinary people. Remember, she didn't call their *opinions* (misguided but) deplorable, she called *them,* about 1/4 of the American population, deplorable. Her partial walkback was a Spock-like emphasis on math, rather than an emotional connecting with those who felt aggrieved. Clinton's competence-centered campaign is reminscent of failure of Michael Duckakis. But she is not Dukakis. She is a Clinton, and they know how to counterpunch. In fact, this is the *third time* she has blown a monumental lead (there's that hubris again). In 2008, she blew a monumental lead against Obama. She kicked and jabbed and scratched and clawed her way back to obtaining more votes (but fewer delegates) than Obama. This spring, she blew a monumental lead against Sanders. She kicked and jabbed and scratched and clawed her way back to obtaining more votes and delegates, and won the nomination. I fully expect her to kick and jab and scratch and claw her way back against Trump. 1. an "elevator pitch" of positives. Fortunately she has a handy template in the Democratic Party platform. All sh e needs to do is embrace it for the next 50 days. 2. She needs her surrogates t tear into Trump every single day. Ideally, this would be the very popular Barack Obama. Like in 2008 and 2012, Obama has been in a diffident slumber once he (or his successor) has been in a substantial lead, only to wake up once disaster loomed. Since the GOP will repeal his entire legacy within 30 days of a President Trump taking office, he has a huge motivation to rhetorically carve Trump into little pieces -- which of course will provoke the worst from Trump. Bottom line: Hillary Clinton has some serious flaws as a condidate. But rolling over in the face of adversity isn't one of them.